Here is a strange little 'Easter egg' in Google Maps Street View. If you look at Street View around Van Ness & Polk St in San Francisco then you will see that Pegman has found a bride. Could it be that someone in the Google Maps team is getting married this weekend? Surely it can't be the wedding of Michael Weiss-Malik who proposed to his girlfriend via Street View when the imagery around the Googleplex in Mountain View was collected. It's weird that his face has since been blurred out, and everyone else there is still un-blurred. No sign of marriage-pegman anymore, so it must have been for this weekend only. 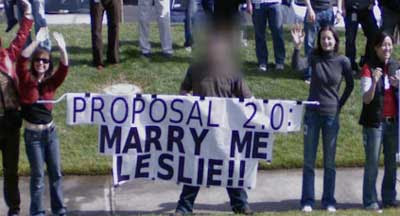 An old article I found said that the streetview guy was planning a May 2009 wedding.